There is no greater fear than what you feel when you press the brake pedal of your car all the way to the floor without any braking response. Air in your brake lines creates a significant safety issue. If you are a do-it-yourselfer, when it comes to auto maintenance, investing in a brake bleeder kit should be at the top of your list of tools and equipment. Getting the best brake bleeder kit to fit your needs can be difficult if you don’t know what to look for. Our brake bleeder kit reviews and buyer’s guide will provide you with the information necessary to make an informed choice. Though you will have to shell-out a pretty good chunk of change to get your hands on the Power Probe Master Brake Bleeder Kit, you will have all bases covered when you make the investment. 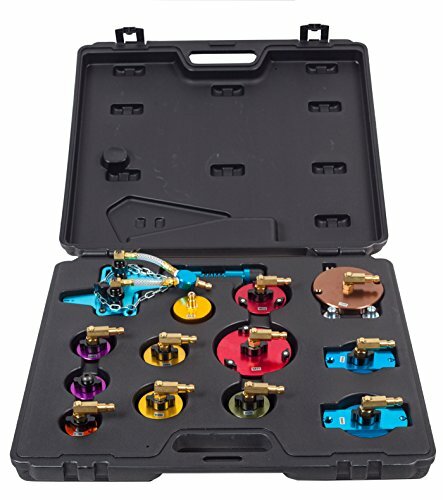 With twelve, color-coded adapters, you have incredible versatility when it comes to being able to bleed just about every make and model of car in existence. Each component is made of anodized cast aluminum-alloy steel. Leaks are not an issue with this product’s expanded o-ring design. • Perfectly suited for a professional shop where all different makes and models of cars are serviced. • It comes with color-coded adapters for easy use and selection. • Longer wearing due to anodized finish. • Expandable o-rings prevent leaks. • 90 degree male hose couplings fit a wide variety of brake bleeders. • Is not an actual bleeder kit, just all of the necessary adapters for bleeder kits. • This kit is overkill if you are only going to be working on your own cars. The push pump style power bleeder produced by Motive Products is one of the most popular solutions to bleeding brakes available on the market. This bleeder kit comes with a push handle pump on a high capacity fluid reservoir, which includes a pressure gauge for greater accuracy. It features the necessary tubing and attachment for pressure bleeding. This setup presses fluid through your brake system in the same direction as your brake pedal, so you won’t have to worry about causing damage to any seals or brake lines. Proper levels of pressure using the pressure gauge also prevent damage or under bleeding issues. • Can be used to bleed brake systems or clutch systems. • Utilizes higher quality pressure bleeding method. • Continuously applies fluid to your system while you bleed the lines. • Ample reservoir capacity for larger volume braking systems. • Pressure gauge helps provide greater pressurization precision. • Not as easy and convenient to use as pistol grip style pumps. • Requires the purchase of various adapters to fit different models of cars. • A bit on the pricey side. Compatibility is one of the highlighted features of the ARES 2L Manual Brake Fluid Pressure Bleeder. You can easily work this system to pressure fill fluid into your brake system by yourself. It comes readily compatible with the master cylinders on most makes and models. A built in pressure gauge allows for greater accuracy when it comes to brake system pressure and it will work on either disc or drum style brake systems. • Single user design makes it easy to bleed your brake system on your own. • Pressure gauge allows you to monitor system pressure with greater accuracy. • 2L fluid reservoir accommodates higher capacity systems. • Master cylinder adapter fits a wide variety of makes and models. • A little bit on the expensive side for those who only use it a few times over several years. • Not as versatile as pistol grip pumping systems. • Adapter does not fit GM models. The most effective and user-friendly model in our lineup comes in the form of the Phoenix Systems 2104-B Reverse Brake Bleeder. Reverse bleeders guarantee the removal of trapped air because they force air in the direction it wants to go; up. The kit comes with hoses and attachments, a reservoir and a pistol grip pressure pump. It allows you to easily bleed your brake system without requiring anyone to help you and is one of the two recommended methods of brake system bleeding approved by automobile manufacturers. • Reversed bleeding provides the most effective air removal. • Adaptable to all types of brake fluids and brake systems. • Utilizes a convenient pistol grip pump. • The most user-friendly method of brake bleeding. • Can be used on clutch systems as well as brake systems. • This unit does not come with a pressure gauge. • The affordability of this unit is a little above some budgets. 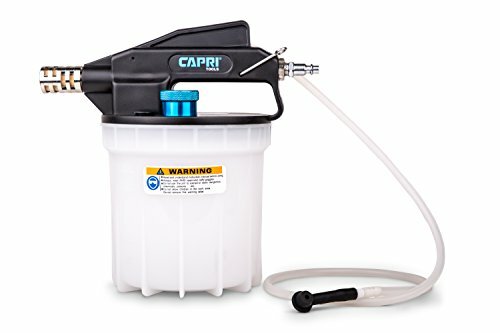 In the world of vacuum bleeders the Capri Tools Vacuum brake bleeder is toward the top of the heap. This unit utilizes an inbuilt Venturi system, which attaches to your air compressor to power its suction. It comes with a 40 inch silicone hose, a rubber adapter to fit all sizes and a high capacity fluid reservoir. This kit can be used to flush ABS or standard brake systems as well as hydraulic clutch systems. • Well-built for greater longevity. • 2 liter capacity reservoir is highly compatible with most systems. • Includes an easy-grip pump handle. • User-friendly, which uses less effort with air compressor pumping. • Adaptable to a wide variety of applications. • There are some issues with air compressor coupling. • Vacuum brake bleeding is discouraged by automobile manufacturers as being inferior in efficiency. • Requires an air compressor to use it. Besides being able to bleed your brake system, the HFS R 2 in 1 Brake Bleeder and Test Tuner Tool Kit also allows you to test the pressure level of your brake system as you work. 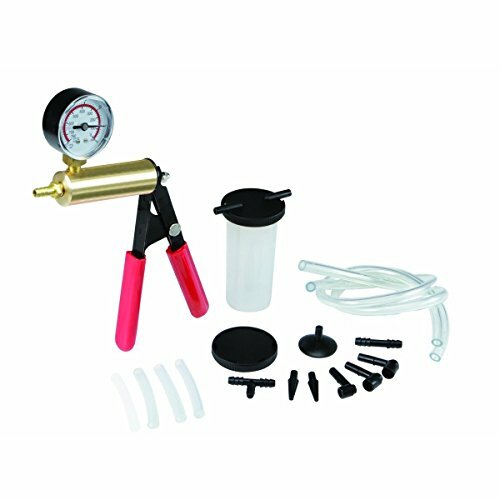 This kit includes a pistol grip vacuum pump with an attached gauge, two 24” silicon hoses, a wide variety of adapters for improved compatibility and a fluid reservoir. It allows you to test the pressure of your brake lines so that you know when the job is done right. • Solid design and construction of the pistol grip pump. • Fittings seal well in order to prevent leakage. • Pressure gauge allows for monitoring system pressure while you work as well as testing it once you have finished. • It comes with a variety of adapters for versatility. • It is one of the most affordable systems available. • The fluid reservoir capacity is pretty limited. • Vacuum bleeding is not recommended by automobile manufacturers. • Its pressure gauge is fragile. A near twin to the HFS model reviewed above, the FEMOR Hand Held Brake Bleeder and Test Kit also allows both vacuum bleeding and brake system pressure testing. 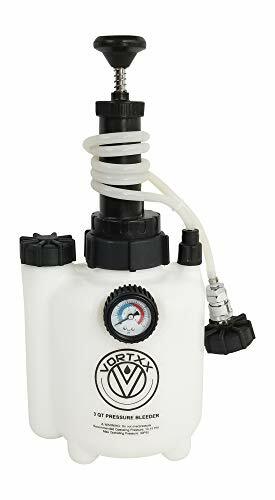 It also comes with a pistol grip vacuum pump with an attached gauge, two 24” silicon hoses, a wide variety of adapters for improved compatibility and a fluid reservoir. This unit allows you to bleed your brakes without assistance and lets you monitor pressure as you work. • A little bit lighter weight than its twin. A higher quality option to vacuum brake bleeding systems is the Vortxx 3L Pressure Brake Bleeder. The highlighted feature of this system is it European adapter, which allows you to word with German, Swedish, French and British built models. It utilizes a hand pump style with a high quality aluminum alloy plunger to create pressure in a high capacity 3 liter reservoir. This system comes with a built in pressure gauge to monitor pressure as you work. Besides working on European models, it is also compatible with most American made cars as well. • Uses recommended pressure bleeding instead of vacuum bleeding. • It includes a high capacity 3L reservoir tank to accommodate all brake system levels. • Includes a pressure gauge to monitor system pressure while you work. • Works on most American models as well as a wide variety of European models. • Costs more for than typical vacuum pressure bleeders. • Pressure gauge measures in PSI instead of in/Hg, which might confuse some users. 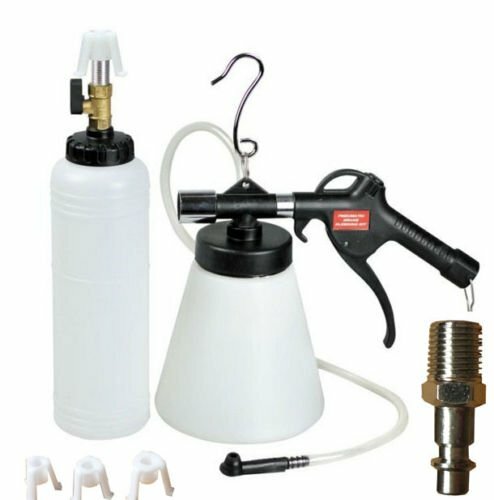 The Generic Pneumatic Brake Fluid Bleeder utilizes the power of your air compressor to pressure bleed your brake system. Among the highlighted features of this brake bleeding kit are the 4 master cylinder adapters that are included with it. It comes with a 34 oz. waste fluid tank and a 24 oz. new fluid tank along with the necessary hoses and fitting for attaching to the brake system as well as your air compressor. This is a highly effective means of flushing your brake system, which comes at a cost similar to vacuum bleeder kits. 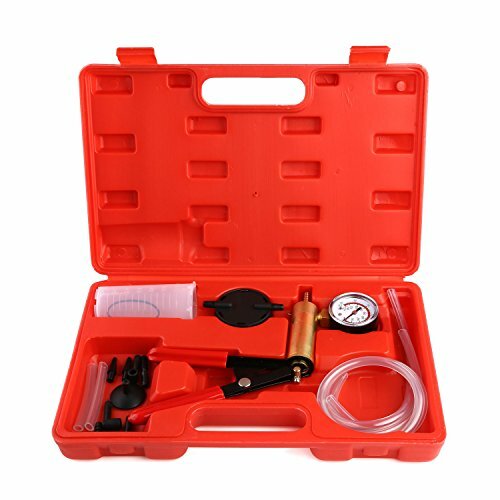 • This kit utilizes your air compressor to pressure bleed your brake system. • It comes with high capacity new fluid and waster fluid reservoirs. • 4 included master cylinder adapters allow for better versatility. • More efficient and user-friendly flushing, as recommended by automobile manufacturers. • Comes at the same price as top vacuum style bleeders. • Requires an air compressor in order to bleed your brake system. • Does not have a pressure gauge for monitoring system pressure while you work. Comparing brake bleeder kits is one of the best ways to find the highest quality product at the most affordable price. However, quality is based on a number of variables included in the benefits and features of a product. Our buyer’s guide is designed to provide you with a set of criteria with which to distinguish between the value of various brands and models of brake bleeder kits. Why do you need brake bleeder kit? Air in your brake lines creates a potentially dangerous situation when your brakes on your automobile fail to work when you need them. If you change your own brake fluid instead of taking your car into a shop to have it done, you will need to bleed your brakes in order for them to work properly. Two people can accomplish this task using the pump and hold method. However, if you’re on your own and do not want to wait for gravity to accomplish the removal of air bubbles, which can take several hours, then you can accomplish the task quickly using a brake bleeder kit. How does a brake bleeder kit work? A brake bleeder kit is a simple piece of equipment that takes no special training to use. It includes a pump, a reservoir and some lengths of tubing. Essentially, the pump is used to either draw air bubbles out of the brake lines or force air through them in order to force the air bubbles out. The same objective can be accomplished by pumping your brakes with the brake bleeder valves open, but requires two people. What are the various types of brake bleeding methods? • Pump and Hold Bleeding. Using this method, the brake pedal is pressed and held down as each bleed screw is opened to allow air bubbles to escape. The screw is then closed and the brake pedal is released. The process is repeat with each brake. The disadvantage to this method is that it requires a person to pump and hold the brake pedal while the other opens and closes the valves, unless one-way bleeder valves are installed. • Vacuum Bleeding. For vacuum bleeding, a vacuum pump is attached to the open bleeder valve. 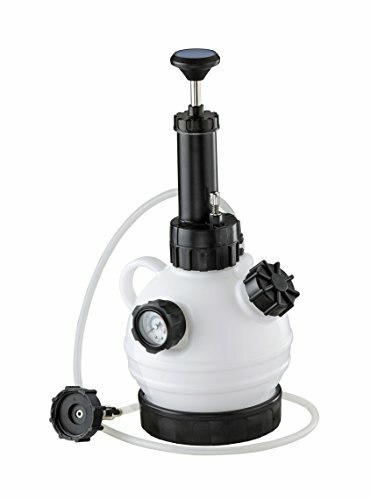 The pump extracts fluid and air until the pump runs clear of bubbles. The fluid flow is much faster and a person can use this method without assistance. • Pressure Bleeding. Pressure bleeding involves attaching a pressurized system to the master cylinder. Pressure in the lines is maintained as each of the bleeder values is opened and the fluid runs free of air. Some pressure pumps will keep the brake fluid reservoir full during bleeding. This is also faster than gravity bleeding and can be accomplished by one person. • Reverse Bleeding. This method uses a pump to force fluid through the bleeder to the master cylinder where it will rise to the top and escape out of the braking system. A person working alone can also use this method to rapidly bleed brake lines. • Gravity Bleeding. A much less effective means for bleeding brake systems, this method feeds new fluid into the system while the old fluid drains out. The idea is that the fluid entering will push out any air bubbles that might develop. Though this can be accomplished by a person working alone, there is the possibility that air bubbles in the system will rise faster than the fluid can push it out, making it less effective. In addition, it can take several hour for all of the fluid in the system to be replaced. What are some features to compare between brake bleeder kits? Various features combine in order to determine the value and effectiveness of a brake bleeder kit. Those kits with more features and features made of higher quality materials may require a more significant initial investment, but they will also have greater versatility and serve your needs for a longer period of time. 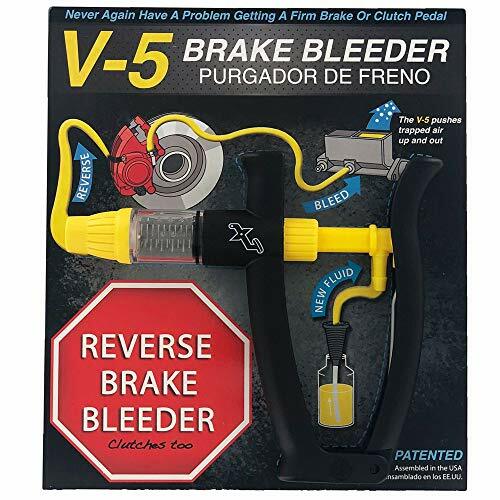 Only three of the methods of brake bleeding we have already discussed require a bleeding kit: vacuum bleeding, pressure bleeding and reverse bleeding. Each of these methods has its advantages and disadvantages. • Vacuum bleeding is among the easiest methods to use, but it is less effective than the other two methods and requires a greater time commitment. In addition, vehicle manufacturers frown upon using this method. • Pressure bleeding is a little more complicated, but is more effective and a bit faster than vacuum bleeding. It is a vehicle manufacturer approved method. • Reverse bleeding is the easiest of the three methods as well as being the most effective and the fastest. It is also an approved method of vehicle manufacturers. There are various forms of pump types used in brake bleeding kits. The most effective and most convenient among them is the pistol grip style pump. This type is lighter weight, less bulky and allow you a little bit more freedom of movement and body positioning. The reservoir will hold the brake fluid that you are bleeding through your braking system. Its size needs to be able to accommodate the total capacity of the brake system. Keep in mind that not all brake system reservoirs contain the same amount of fluid, so if you intend to use your bleeding kit on a wide variety of vehicles, you will want to choose a more generous reservoir to accommodate systems that require a greater amount of brake fluid, rather than a less expensive model with a limited capacity. Hoses, attachments and adapters lend greater value to a bleeder kit because it makes it more versatile. Besides having properly fitting essentials, be sure that all the accessories included with your kit fit properly and prevent air leakage or you will be working against what you are trying to accomplish. One way to spot a higher quality brake bleeder kit is the addition of a pressure gauge. The advantage of a pressure gauge is being able to determine whether you are over or under bleeding your brake system. Pressure gauges measure square inches of mercury (in/Hg). A quality gauge will accommodate measurements from 0 to 30 in/Hg. Cheaper is not always the best option. Too often, a bleeder kit comes at a budget price but lacks the material quality to last or the necessary design quality to be effective. A brake bleeder kit featuring all of the best components mentioned above is likely to cost more initially, but save you money over the long-term. Keep in mind the price of having the same maintenance performed in a shop over a period of several years and you will quickly grasp the value of a brake bleeder kit. Among the car maintenance tools and equipment you use in your shop, few are as important to safety as a brake bleeder kit. Choosing the right one can mean the difference between a job done right and dangerous situation. Our brake bleeder kit reviews and buyer’s guide have provided you with the information you need to compare various brands and models in order to choose the one that best fits your needs. Use the information you’ve gained before selecting a brake bleeder kit. CarCleanZone.com is a participant in the Amazon Services LLC Associates Program, an affiliate advertising program designed to provide a means for website owners to earn advertising fees by advertising and linking to Amazon.com. You can read more about this on our Affiliate Disclaimer page.